I have heard of Thee, and of Thy healing; that Thou dostnot use medicines or roots, but by Thy word openest (the eyes) of the blind, makest the lame to walk, cleansest the lepers, makest the deaf to hear; how by Thy word (also)Thou healest (sick) spirits and those who are tormented with lunatic demons, and how, again, Thou raisest the dead to life. And, learning the wonders that Thou doest, it was borne in upon me that (of two things, one): either Thou hast come down from heaven, or else Thou art the Son of God, who bringest all these things to pass. Wherefore I write to Thee, and pray that thou wilt come to me, who adore Thee, and heal all the ill that I suffer, according to the faith I have in Thee. Happy art thou who hast believed in Me, not having seen me, for it is written of me that those who shall see me shall not believe in Me, and that those who shall not see Me shall believe in Me. As to that which thou hast written, that I should come to thee, (behold) all that for which I was sent here below is finished, and I ascend again to My Father who sent Me, and when I shall have ascended to Him I will send thee one of My disciples, who shall heal all thy sufferings, and shall give (thee) health again, and shall convert all who are with thee unto life eternal. Having been refused on the matter of coming with him, Hannan sat down to make a painting of Jesus and, yet, was unable to do so. He was unable to capture the glorious compassion and love in the face of Jesus and, consequently, failed to produce a painting that truly represented the face he was seeing. Noticing Hannan's failures, Jesus washed his face, took a cloth and dried it, and gave the cloth to Hannan. 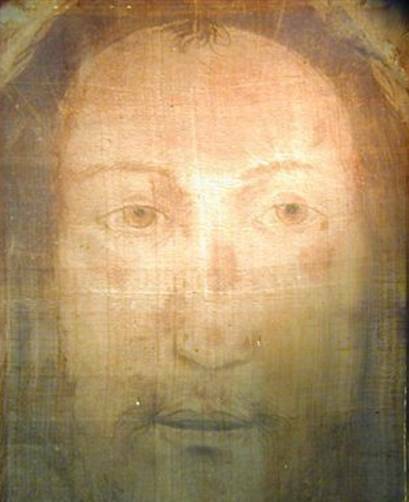 Legend holds that the appearance of Jesus' face was made to stay upon the cloth as an image to take back to Abgar. Thus, the first icon was made by Jesus' hands and is, therefore, described as: acheiropoietoe ("made without hands"). From this, some draw Jesus' approval of iconography and the process of writing spiritual imagery. Hannan carried the icon of Jesus back to Abgar and Abgar's faith in Jesus' words partially healed him. After Jesus' death, resurrection, and ascension, Thaddeus (one of Jesus' disciples) was sent by St. Thomas to go to Abgar and heal him. Thaddeus arrived and finished the healing work that Jesus had started. Upon this miracle, many were converted to follow after the same Jesus whom they had seen but never met and trusted yet never spoken to. In the icon, there is comfort for those whom have not seen Jesus and, yet, have faith. In the icon, we engage the Lord God Almighty--King of the Universe--through the things that God has created--wood, egg, dirt, gold--and remind ourselves that God is not an aloof and distant God but a close and intimate God who offers healing and redemption even to those in the far reaches of the world. There is much to learn from the legend of Abgar, assuredly, but one particular point is the importance of image (note: not idol) for Christian teaching. Just as the Triune God became flesh so that we might gain access and redemption, the spiritual has become corporeal in the icon to provide teaching and comfort. Icons are, after all, not things to be worshipped but, rather, holy items that we might worship our common God and Savior.